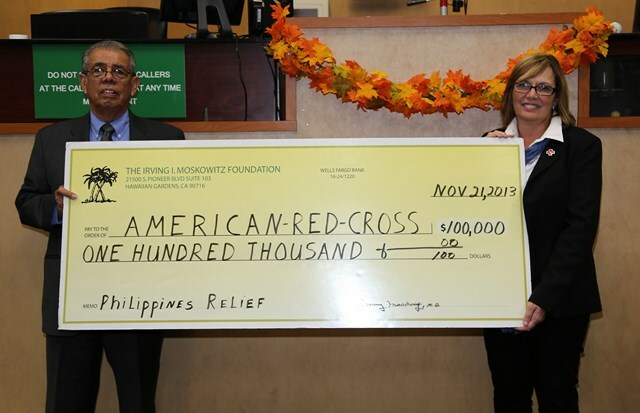 HAWAIIAN GARDENS, California- On Thursday, November 21, 2013, the Irving I. Moskowitz Foundation will present a check for $100,000 to the American Red Cross-Long Beach Chapter to aid the victims of Typhoon Haiyan in the Philippines. The check presentation will take place at 6 p.m., at The Bingo Club- 21900 Norwalk Boulevard. “After learning about the catastrophe that struck the Philippines on November 8, I immediately knew that we had to help the people of the Philippines,” said Cherna Moskowitz, President of the Irving Moskowitz Foundation. Super Typhoon Haiyan swept across the Philippines on November 8, 2013, causing massive destruction and reported to be one of the largest disasters its country has ever faced. More than 300 miles wide- about the distance from Boston to Philadelphia- the typhoon left a path of destruction. Philippine authorities have reported that more than 11 million people have been affected by the typhoon, with more than 1 million homes destroyed. 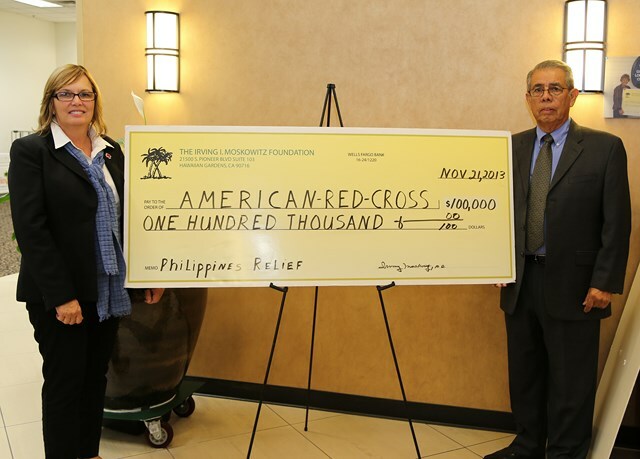 The Irving I. Moskowitz Foundation’s contribution to the Typhoon Haiyan Relief Effort will help the Red Cross provide shelter, food, and many other services to the affected families. The Irving I. Moskowitz Foundation was established in 1968 by Dr. Irving I. Moskowitz. The Foundation is a charitable non-profit organization that is committed to improving and enriching the lives of those in need, especially during the time of crisis. To date, the Foundation’s monetary contributions to the American Red Cross exceed $1 million dollars.